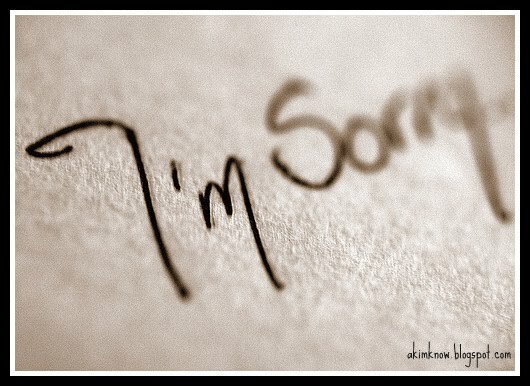 Relationship | Marriage | Love | Issues: Saying "I'm Sorry"
"Sorry" seems to be the hardest word. Why is that so? When you are in a relationship, saying "I'm sorry" is significant. It's like a super glue of life that can repair just about anything by saying those two words. Saying "I'm sorry" sincerely or sincere apology is not a sign of weakness. On the contrary, the recognition that you are at fault will strengthen her marriage and your spouse's admiration for you. Do not let pride and stubbornness stand in the way of sincere apology when you are wrong. We all need absolution sometimes. When times come, the strength of your marriage will rest in their willingness to make things right with her six little words: "I was wrong. Please forgive me." Remember that admitting a mistake and apologizing for it is the quickest way to cool a hot situation. Would you date your best friend's ex? What Heart-Break Songs You Listen To?